Maarkandam Soup, Mutton Nenju Elumbu Soup Recipe – Mutton rib bones soup. Very lite flavourful broth. Excellent remedy for cold and flu. மார்க்கண்டம் சூப் – நெஞ்சு எலும்பு சூப். 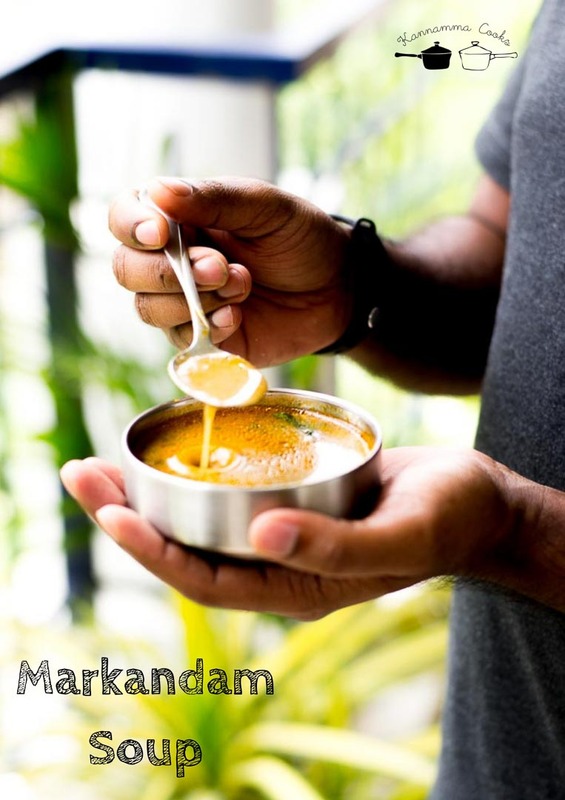 Maarkandam soup is a very lite soup made with mutton rib bones (nenju elumbu as its called in tamil). The long cooking of the bones brings out the flavour and the broth tastes very delicious. 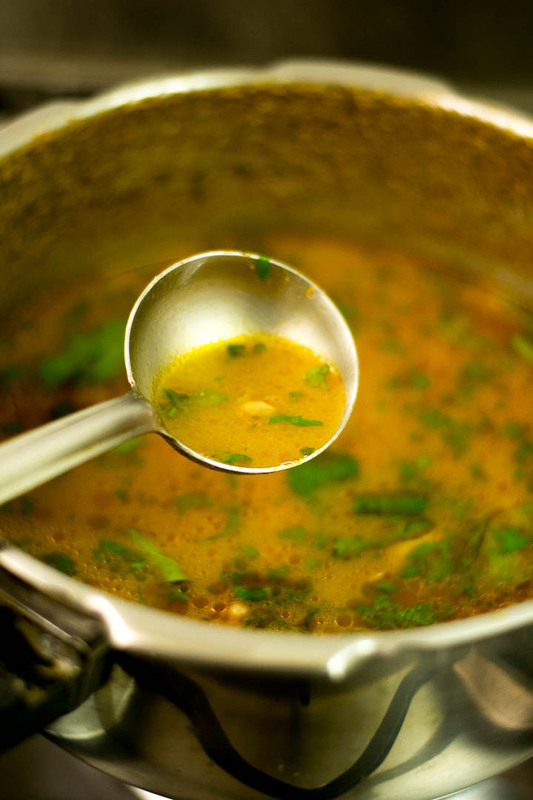 The broth is then cooked along with an aromatic home ground masala and spices. This soup is very lite and not fatty. The addition of ground coconut adds to the richness of the soup. Excellent when feeling under the weather. 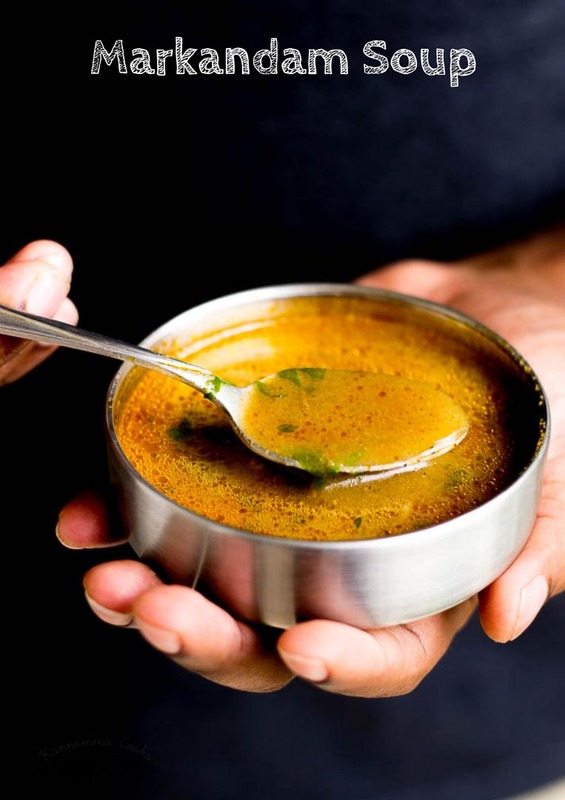 Traditionally, this soup is also served to new breastfeeding moms in many parts of Tamilnadu. This soup is one of our house favorites. We like to have it with rice. If you cannot get mutton rib bones, you can do it with normal mutton / lamb bones too. 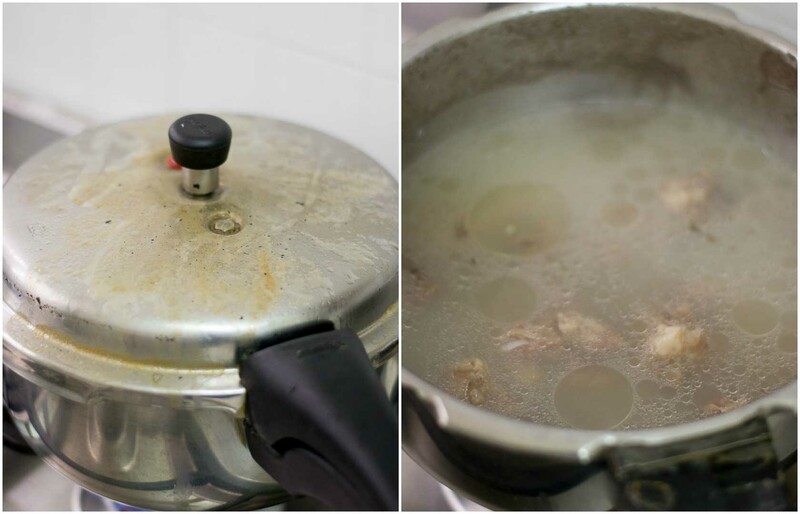 Boil the mutton rib bones with salt and water for 30 minutes in a pressure cooker on a medium flame. (Measurements – See below) .Ignore the number of whistles. 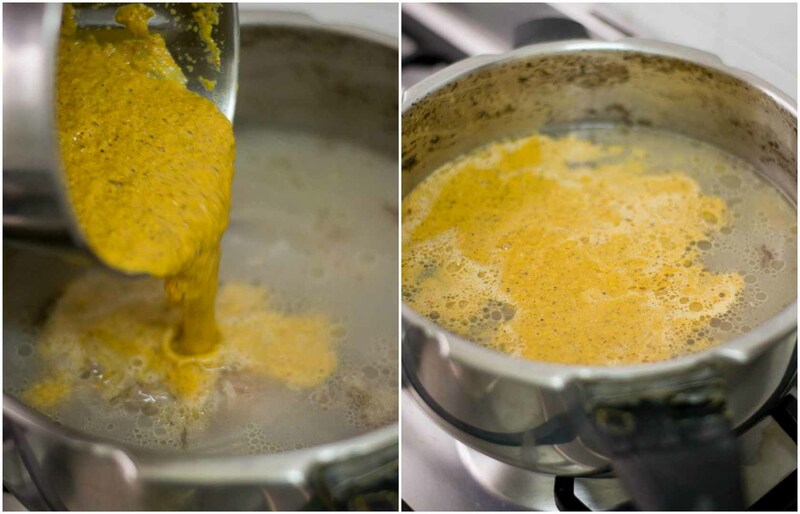 Cooking for a long time will render the juices from the bones and make the broth more flavourful. 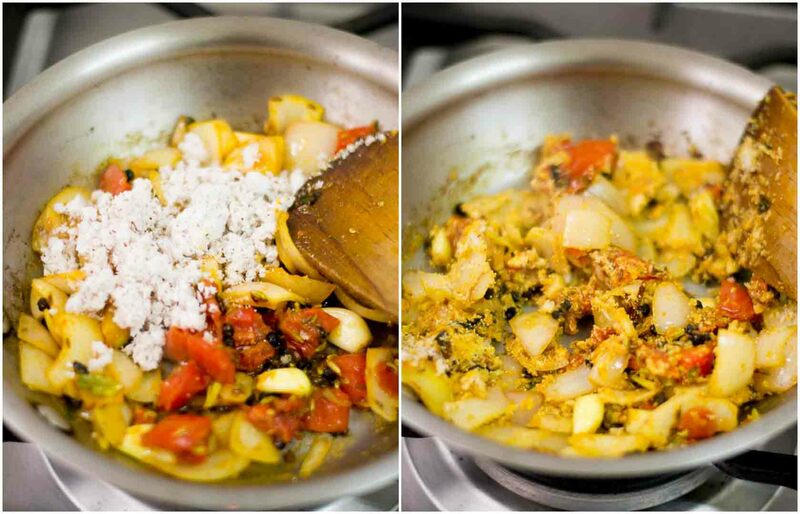 Heat ghee in a pan and add in all the spices (cardamon, cinnamon, kalpasi, clove, black pepper, cumin and fennel). Roast all the ingredients on a low flame for 3-4 minutes. The spices will turn very aromatic and will change color to slightly golden / brown. Add in the diced onion and the tomato. Also add in the peeled ginger and the garlic. Add in the salt and turmeric and saute everything for a minute. Note that we have already salted the broth. So go easy on the salt. 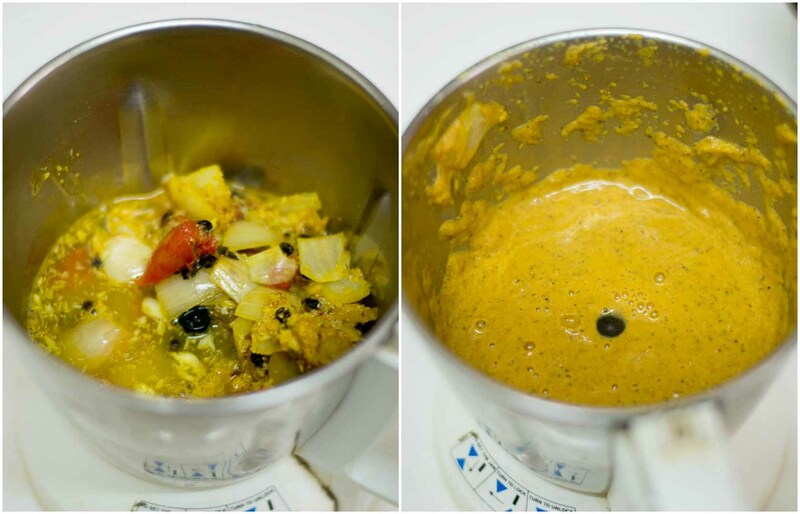 Add in the fresh shredded coconut and the poppy seeds (khus khus – gasa gasa). If you cannot source poppy seeds in a country where you live, just omit it. 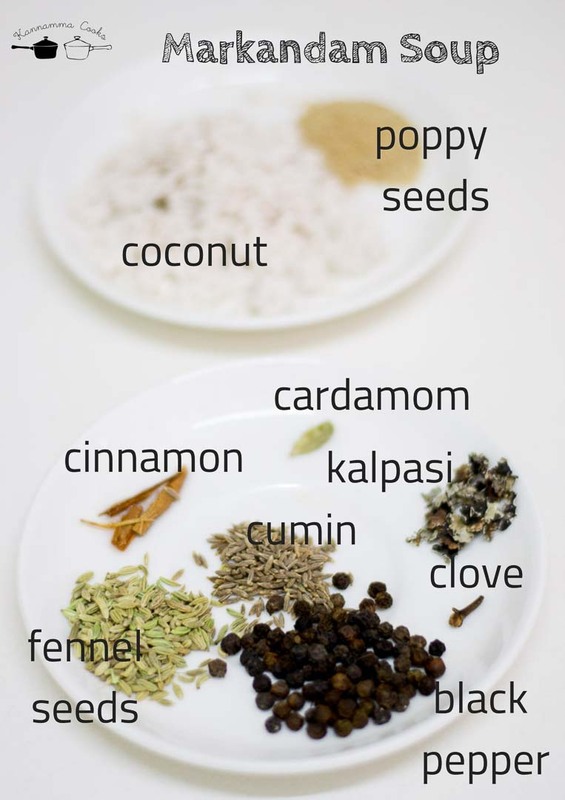 (Poppy seeds is banned in the middle east as its considered an opium). Saute for a minute more. Remove off from heat and set aside to cool. Once the mixture is cool, grind to a paste along with a cup of water in a heavy duty mixie. Set aside. 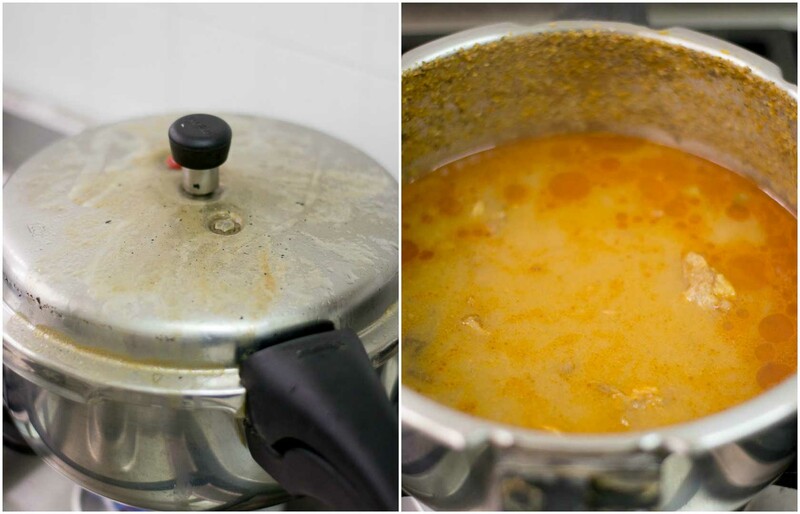 Add the ground masala to the broth that is sitting in the cooker. If the soup is very thick at this stage, add more water as necessary. Cover the cooker and cook for 15 minutes on a medium flame. Ignore the number of whistles. After 15 minutes, switch off the flame and wait for the pressure from the cooker to settle naturally. 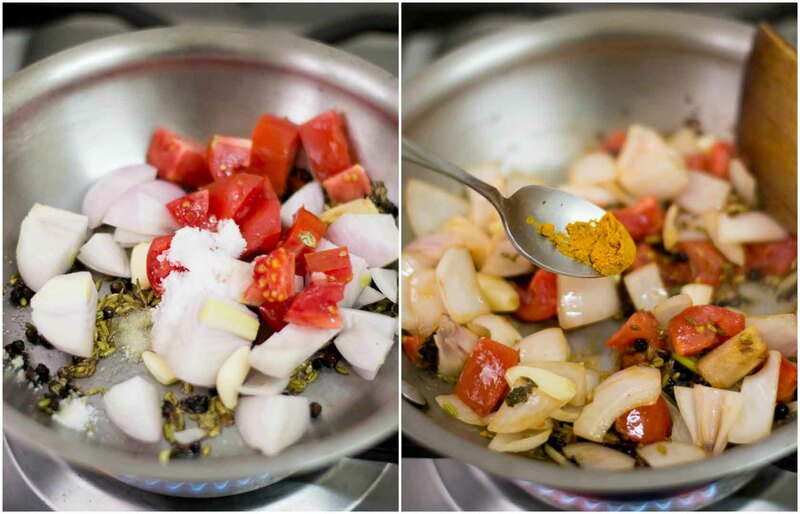 Open the cooker and add in the curry leaves and coriander leaves. Fresh curry leaves adds a very nice aroma to the soup. Discard the bones if serving as a soup for first course. Serve the soup as a first course. You can also serve with rice. It tastes so comforting and lite. Maarkandam Soup, Mutton Nenju Elumbu Soup Recipe – Mutton rib bones soup. Very lite flavourful broth. Excellent remedy for cold and flu. மார்க்கண்டம் சூப் – நெஞ்சு எலும்பு சூப். Boil the mutton rib bones with salt and water for 30 minutes in a pressure cooker on a medium flame. 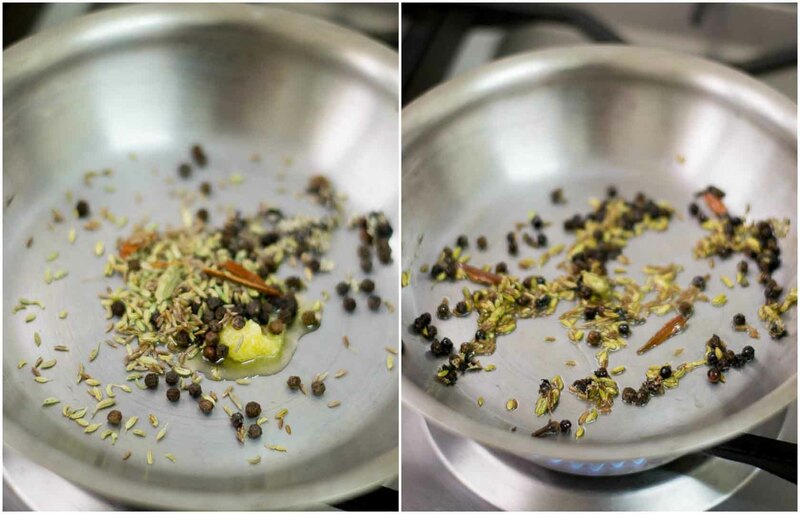 Heat ghee in a pan and add in all the spices (cardamon, cinnamon, kalpasi, clove, black pepper, cumin and fennel). Roast all the ingredients on a low flame for 3-4 minutes. Add in the salt and turmeric and saute everything for a minute. Add in the fresh shredded coconut and the poppy seeds. Saute for a minute more. Remove off from heat and set aside to cool. Add the ground masala to the broth that is sitting in the cooker. If the soup is thick at this stage, add more water as necessary. 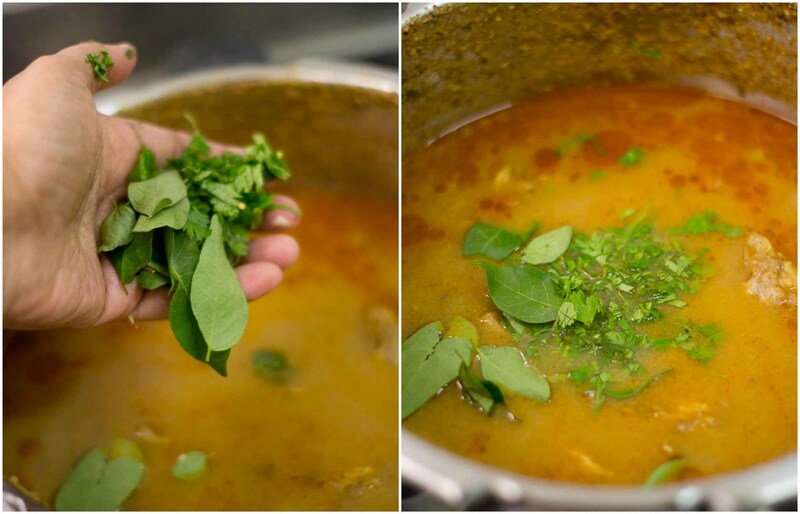 Open the cooker and add in the curry leaves and coriander leaves. Fantastic receipe. My husband is a big fan of mutton. I tried it today and it came out so well. We throughly enjoyed it. Thanks a lot!! Thank you so much. Hope your son recovers soon. Happy cooking. 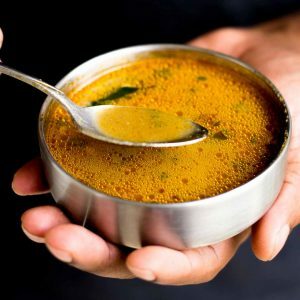 Semma semma….the way u explained my mouth start watering.thank u very much.my huby work out of station, next week he is coming back.just was thinking wat to cook for him, I saw it this nenju elumbu soup recipe.its awesome……thank u once again.romba romba nandri.Ester from Mumbai. Tropical country la soup starter ah epdi ka sapdrathu? Saptu mudichutu thaan rasam maari kudikanum. Anyways thanks for the recipe. Will try soon!